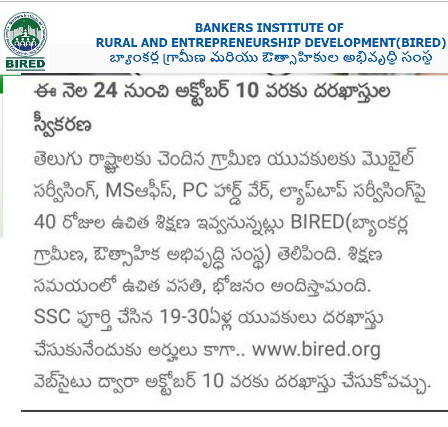 BIRED NEW BATCH ANNOUNCEMENT :: New Gents Batch is going to start from 23.10.2018 to 30.11.2018 with Five Programs. 1. Mobile Servicing, 2. MS Office, 3. PC Hardware and Laptop Servicing, 4. Domestic Electrician and Pump set Repairing and 5. Accounting Package-Tally with GST . Interested Candidates Can Apply Online from 24.09.2018 to 10.10.2018. BIRED announced the commencement of the fourth in-campus training programs for the year 2018-19 at our institute from 31.08.2018. We request you to kindly identify eligible men through your branches / offices (preferably rural) and sponsor them to our institute. The training programmes will be in-campus, 40 days duration residential in nature commencing from 31.08.2018 and will be completed by 10.10.2018. The persons with professional qualification like BE/ B-Tech, MBA, MCA, B.Ed., and College going students are not eligible for the training. We request you to identify only such candidates who are willing to attend the programme, uninterrupted for 40 Days.Those candidates who desire to leave the institute before completion of course for any personal reasons, Trainee has to pay Rs. 150/- per day for the period of their stay as penalty. No training certificate will be issued to such candidates. On receipt of nomination, we shall convey our confirmation/consent to the candidates over phone / message after interviewing them by phone. The admissions will be confirmed on first come first basis (For MS-Office by simple test) only. 5. 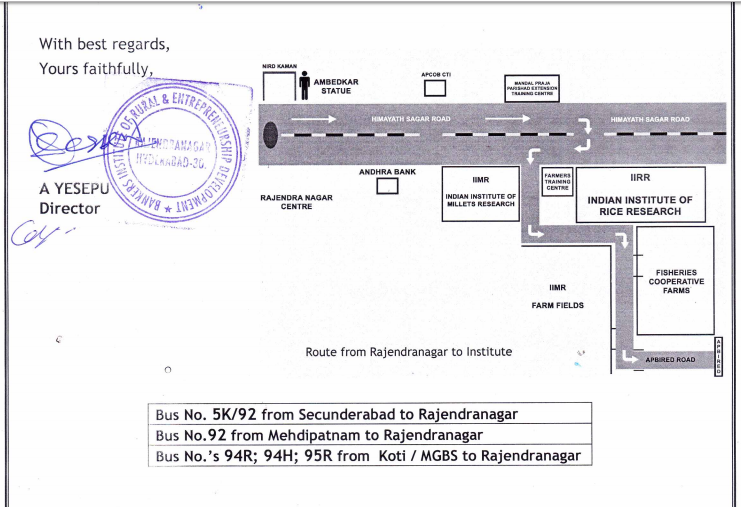 Aadhar Card for our records and placement needs. The originals will be returned to the candidates at the end of the course. Candidates who are not having original certificates with them need not be sponsored. TWO PASS PORT SIZE PHOTOGRAPHS ( CANDIDATES INTERESTED IN PARTICIPATING IN CAMPUS RECRUITMENT SHOULD BRING ATLEAST 4 MORE PHOTOGRAPHS). ONE SET OF XEROX COPIES OF 2, 3 AND 4 ABOVE. (CANDIDATES INTERESTED IN PARTICIPATING IN CAMPUS RECRUITMENT SHOULD BRING ONE MORE SET). XEROX COPY OF CASTE CERTIFICATE ( IN CASE OF SC/ST/OBC). XEROX COPY OF RATION CARD/ADHAR CARD. XEROX COPY OF AROGYA SREE CARD, IF AVAILABLE. శిక్షణా కార్యక్రమ సమయంలో అభ్యర్థులు ఇన్ స్టిట్యుట్ హస్టల్ లోనే బస చేయవలెను. శిక్షణార్థులకు ఉచిత భోజనం మరియు వసతి సౌకర్యం కలదు. ప్రతి అభ్యర్థికి శిక్షణ కాలంలో ఉపయోగించుకొనుటకు మంచము, పరుపు, దిండు, దుప్పట్లు సంస్థచే ఇవ్వబడును. శిక్షణ పూర్తి చేసిన అభ్యర్ధులకు మాత్రమే యోగ్యత పత్రము మరియు రాను, పోను చార్జీలు (ఎక్స్ ప్రెస్ బస్ / రైలు ) ఇవ్వబడును. చదువు కొనసాగిస్తున్నవారు ఈ శిక్షణ కార్యక్రమానికి అర్హులు కారు. అభ్యర్థులు శిక్షణకు వచ్చేటప్పుడు 45 రోజులకు సరిపడ తమ దుస్తులు, బ్రష్, పేస్ట్ మొ|| సొంత వస్తువులు తెచ్చుకొనవలెను. వ్యక్తిగత వస్తువులను భద్రపరుచుకొనుటకు కావలసిన పెట్టె / బ్యాగు, తాళముతో సహా మీరే తెచ్చుకొనవలెను.